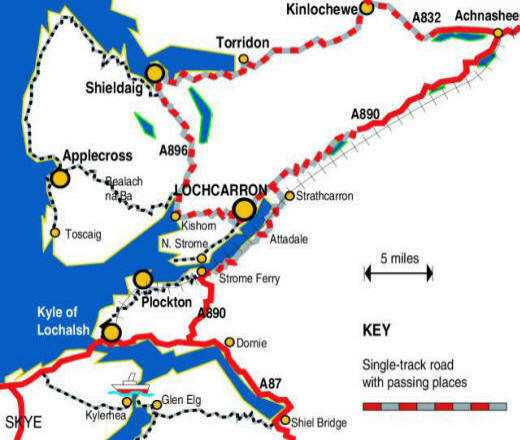 Secondly, the somewhat faster, albeit further, route, which quite simply takes the A9 north from Perth to Inverness, thence via the A835 to Garve, the A832 to Achnasheen, and finally the A890/A896. This route encompasses mostly good fast roads, although the single carriageway sections of the A9 can sometimes seem frustratingly slow in heavy traffic. For railway enthusiasts, we have the famous Kyle Line which featured as one of Michael Palin’s “Great Railway Journeys of the World”. 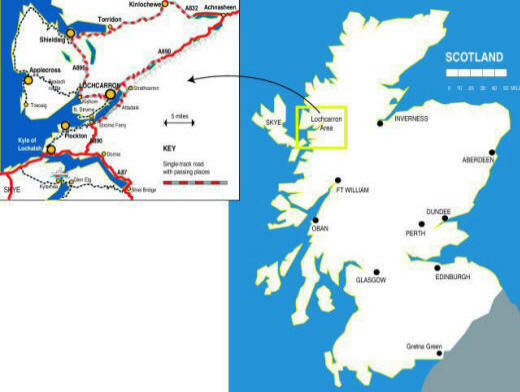 This line runs from Inverness (from where there are rail links to the rest of the UK) to Kyle of Lochalsh and passes through some of the most spectacular scenery in Europe. The nearest railway station to Lochcarron is at Strathcarron, just 3 miles away. There is a local bus service which meets up with the train.